Spaying is a procedure where in which your female cat ovaries and uterus are removed, to prevent her from reproducing. During her reproductive life a female cat could have a hundred or more kittens,this is a generally number depending on how many kittens she has in each litter and how many litter she has. It is very difficult to find homes for all those kittens. Spraying helps to keep the cat population down and also has medical benefits for your cat. Here we will discuss the procedure and the benefits of spraying. The night before the surgery cats are usually not allowed to eat or drink anything for twelve hours, this can be a little hard to implement if your cat is used to a late night snack, but is important because it helps to prevent complications with the anesthesia. Prior to the surgery, cats are placed nder general anesthesia. Their bellies will then be shaved and cleaned so that the docter can make a small incision under the belly button. During the procedure some vets will administer pain medication through an iv and consistently check your cat's heart and lungs, check with your vet to confirm that they do this, and to make sure that they send you home with pain medication for your cat. Through the incision made at the bottom of the belly botton, the vet will then remove the cat's ovaries and uterus. The vet will then stitch up the incision with either a non-absorbable stiches, which have to be removed in 7-10 days, by sutures that gradullay dissolve on their own into your cat's body,or by sub-cuticular stitches. When our cats were spayed, we had to drop them off at 9am and picked them up at 4pm, the surgery itself doesn't take long, but it may take awhile for your cat to wake up after the anesthesia.Your cat's belly will look red and tender, actually when we first saw it the doctor had to reassure us that it was perfectly normal, so I'm reasurring you, it's perfectly normally that's a bit red and very tender. 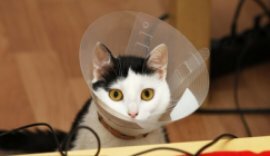 A cone is usually placed around your cat's neck to prevent her from using her teeth and removing her stitches. Most cats hate this cone, because it makes it a bit difficult for them to completely clean themselves. The cone doesn't prevent them from eating or drinking, but if you find that your cat is having difficulty at meal time you might want to change their feeding bowls, to a plate that doesn't have a rim. Your vet usually gives you pain killers with instructions on when to give your cat, if they don't ask for one, after such a surgery your cat will definetely be feeling a bit of pain and discomfort.Cats are usually a little groogy and extra sleepy. If you have kids or other pets, find a nice quiet room in your house where your cat can have some peace and quiet, and place some fresh water and food their for her. Our cats did not eat for a a couple of hours after surgery,but later in the evening had a snack and some fresh water. If your cat is an outdoor cat, she will need to stay inside for at least the first week or even two after the surgery,especially if she has the cone on. Your docter will also encourage you to discourage your cat from jumping and to restrict her activity level, replace play time with petting time. After 7-10 days your cat will need to return to the vet for both the removal of the stitches, removal of the cone, and a check up. Although there are risks in any surgical procedures, the benefits for spaying your cat, far outweight the risks. Female cat that are not spayed are far more likely to get reproductive cancers.Spaying your cat prevents her from going through the heat cycle. Without this operation she will go through three heat cycles a year. In her attempts to find a mate,she will try to run outside, will scratch at the door, howling, crying and spray urine around your home. Have you ever seen a cat in heat? I have, as a child my cat went into heat earlier than my parents expected so they had to wait to spay her. I remember how unhappy the cat looked, she was crying and howling and scratching the door trying to get out. The point is it's not fair to our female felines to have to endure this discomfort unless they are mating and both them and their babies are being taken care of in good homes. Talking about good homes, that's another reason why females cat should be spayed. There are not enough homes that are taking in cats, as a result, cats that are homeless end up being euthanized. Some veterinarians recommend that your cat be spayed at around 6-7 months of age, before their first heat cycle. However there are some vets that recommended your cat has this surgery done at an even younger age,as young as six weeks. Kittens are a bit stronger than we give them credit for and most do bounce back well. We spayed our cats when they were kittens, at around 6 months, after a couple of days they were back to normal.It's best to involved your veterinarian in this decision making process.